Posts are what make your blog a blog — they’re servings of content that are listed in reverse chronological order on your blog’s front page. Posts are always associated with a date. Sometimes, posts are confused with pages. See Post vs. Page for an explanation of the differences. There are several ways to publish new posts. The easiest way is with the + New button on the toolbar (it appears at the top of your screen when you’re logged in to your WordPress website). Clicking on + New will take you to the Add New Post screen. If you are on the WordPress Admin Screens you can also visit Posts > Add New on your sidebar to add a new Post. When you’ve written your Post, hit Publish. You can also access the post editing screen from Posts > All Posts. Here you’ll see a list of all of your posts. Click Edit under the name of a post to be taken to the post edit screen, where you can make changes. To delete a post, click Trash. See our documentation on the New Posts Screen for more details. Watch the “Writing and publishing a post” video from WordPress.tv. 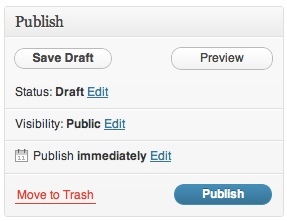 Watch the “Saving and returning to draft posts & pages” video from WordPress.tv.